Every year since 1970, on the 22nd day of April, a group of like-minded folk, who love this wonderful planet that we all call home, have been celebrating its biodiversity and trying to draw attention to environmental issues. It all kicked off back in the USofA, but the movement has grown so much that Earth Day is now the largest non-religious festival in the World with over a billion of us getting involved. Heck! It's even got its own flag, featuring a picture of the Earth taken from the Apollo17 Spacecraft. Now I have to 'fess up: I've come to the party a little late. It's only in recent years that Earth Day has made it onto my radar. But, Johnny-come-lately though I am, I've latched onto this idea with all the gusto of a convert. I think it's marvellous that we have one day on which we stop and celebrate all that is magical and life-giving in the natural world, and on which we honour Mother Nature, drawing attention to the vital importance of conservation. 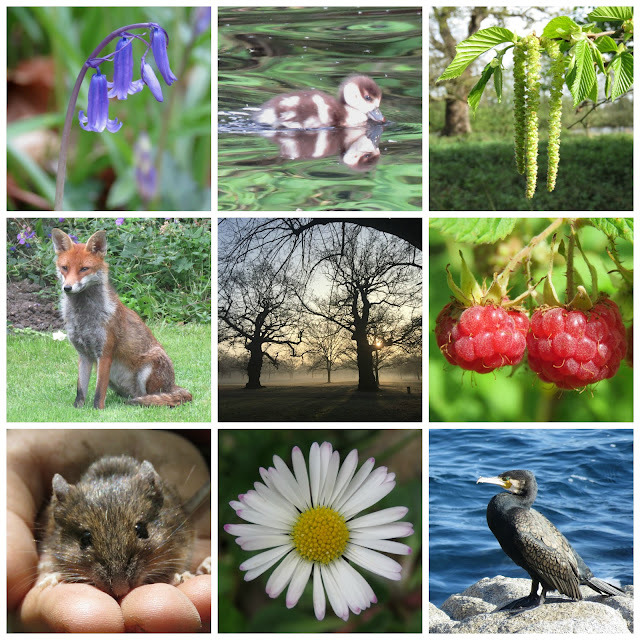 In honour of the occasion I've made my own little homage, celebrating some of my nature-inspired moments from the past year. Even here in the Big Smoke there are lots of opportunities to engage with the natural world, and I'm constantly surprised and delighted by the number and variety of visitors from the animal kingdom who stop by to visit my small back-garden in West London. But, as they say, actions speak louder than words. Rather than just talk, it would be great if we could all take at least one small step in our own busy lives that would make a difference. These small steps need not cost us anything. We could, for example, sort our rubbish properly so that as much of it as possible gets recycled, we could bring a re-usable cup for our take-away coffees or we could drink tap-water instead of expensive bottled water. None of these steps would be life-changing for any of us, but if we all did them, they'd make a big difference. There's an old Chinese proverb about how a journey of a thousand miles begins with a single step. We've got a long way to go, but, if we all do what we can, there's still a chance that our collective efforts might just be enough ... .